Patients diagnosed with advanced liver or kidney disease require a high level of care—an approach that includes regular, thoughtful medical evaluation. Montefiore Einstein Center for Transplantation is pleased to extend its Consultative and Evaluation Service to members of the communities we serve in Westchester; Rockland; New Jersey and Bronx. Our Service is available to help your patients with advanced stage liver or kidney disease. The program's team of noted specialists offers medical evaluations designed to identify and treat any aspect of their condition, and assist in Transplant education and assessment. Have questions? We’re here to help. 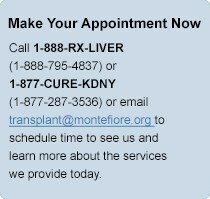 Call 1-888-RX-LIVER (1-888-795-4837) or 1-877-CURE-KDNY (1-877-287-3536) or email transplant@montefiore.org to learn more. Our physician liaison, Christine Miranda is available to discuss how our Transplant Evaluation Service can benefit your patients; call 917-747-0184 today.